Ashwood Manor, Ashwood Manor in Pentney, Norfolk sleeps 10 people. Situated in rural Norfolk, ten miles from the Sandringham Estate, Ashwood Manor is set by the River Nar and offers both space and comfort, with several sporting activities on offer, and plenty of room to relax amid beautiful surroundings. Adjoining the owners’ home, both properties (refs CLU, CNK [Ashwood Wing]) are located in extensive grounds with gardens, a lake, and an indoor heated swimming pool with sauna. Further facilities include an exercise room, children’s adventure playground and games room. Ashwood Manor has been renovated and offers comfortable, well furnished rooms, ideal for large parties. 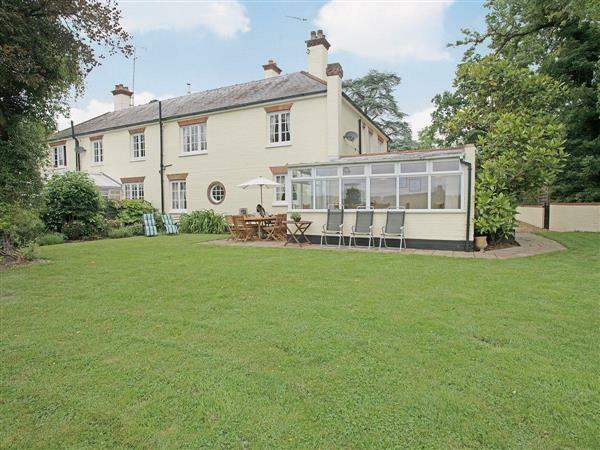 There is a spacious sitting room with lovely views over the lake and countryside, separate dining room, and attractive kitchen leading to a conservatory, as well as five bedrooms, one with a king-size four-poster. Ashwood Wing offers smaller but equally comfortable holiday accommodation for a group with fewer people. Guests at both properties have their own enclosed garden and access to the owners’ 7 acres of paddocks; the lake is close to the house but is fenced for safety. Fly-fishing and coarse fishing is available all year round at Narborough trout and coarse lakes ½-mile away. Lake at house available for fun fishing. Living room with wood-burning stove. Dining-room with wood-burning stove. Well-equipped farmhouse-style kitchen and doors to conservatory. Utility. Twin-bedded room. Shower room/W.C. First floor: Two double bedrooms with 5ft beds each with en-suite shower room/W.C. Further double bedroom with 5ft canopied bed. Twin-bedded room. Bathroom/W.C. with shower attachment. Additional TV in two double bedrooms. For a better idea of where Ashwood Manor is, you can see Ashwood Manor on the map below. Ashwood Manor is in Norfolk; should you be on the lookout for a special offer, you can find all the special offers in Norfolk. It's always worth checking to see what is on offer at the moment. Do you want to holiday near Ashwood Manor (CLU), you can see other cottages within 25 miles of Ashwood Manor; have a look to find your perfect holiday location.